If you are a health professional working with patients in Wandsworth, you can refer to us. We accept referrals for adults with severe and enduring mental health conditions who are currently inactive. Physical activity can have a huge positive impact on both mental and physical wellbeing. Active Wellbeing matches each client with an exercise instructor who helps to develop a tailored plan for their needs. Past activities have included using the gym, walking and running outdoors, tennis, swimming and dance. Over the 10 weeks, they exercise in a place local to them, at a time convenient for them. At the end of the programme, we support the client in continuing with their exercise routine and provide follow-on support at six and twelve months. “The programme is great, individually-tailored and comprehensive. My clients highly recommend it. Throughout the programme I always receive updates on my clients progress, which Is very helpful in delivering high quality care on the multidisciplinary level”. 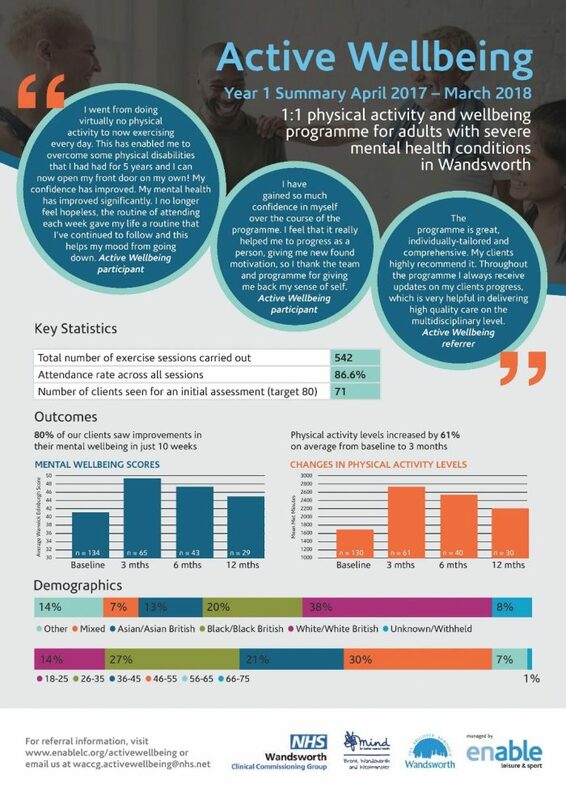 We have had very positive results from the programme, with clients improving their mental wellbeing, losing weight, and decreasing blood pressure. Some of our key statistics are shown in the infographic below. Patients can be referred by completing this referral form and sending it to waccg.activewellbeing@nhs.net.